NIA CHARLESTOWN NEVIS (December 03, 2014) — The following is a statement by Premier of Nevis and Minister of Finance in the Nevis Island Administration (NIA) Hon. Vance Amory on December 03, 2014, on the Administration’s 3rd quarter fiscal review for the period June to September 2014. Fellow Nevisians, I speak to you in respect of the performance of the Nevis Island Administration for the third quarter January to September 2014. It is no secret that we have had to operate under difficult financial conditions over the past few months. Increasing fiscal deficits and high levels of indebtedness were some of the challenges that my Administration inherited and have had to overcome. In spite of the challenges, we continue to look ahead to a period of growth, prosperity and an increase in the well-being of our people. We are confident that our economy is on the right path and that the policies we implement today will bring the desired reward in the short and medium term. My Administration, had to take steps to modify the programmes of government and to implement measures which would at a minimum, stabilise the fiscal position in the short term, with a medium term objective of significant improvements. With implementation of sound fiscal reforms and changes in economic policies, we are now witnessing a gradual turnaround in our economy. I am aware that we will be providing for you a full budget in another week or two. However, as we look at performance of the CCM Administration for the first nine months of this year, we have generated an overall surplus of $2.82 million on fiscal operations. This performance was due largely to an improvement in our total revenue collection coupled with strict implementation of expenditure controls. Revenue grew by 7.37 percent when compared to the corresponding period in 2013, increasing from $88.34 million to $94.80 million in 2014. Conversely, Recurrent Expenditure saw a decline by 1.47 percent over the same period, decreasing from $85.34 million in 2013 to $84.08 million in 2014. The increase in recurrent revenue and the fall in recurrent expenditure, have led to a surplus of $10.72 million in our short term fiscal balance. In assessing the performance of our current expenditure for this period under review, it is evident that we have made serious efforts to curtail expenditure. In comparison to the 2013 annual budget, expenditure on the current account amounted to 62.92 percent of budgeted expenditure up to the end of the third quarter. Personal emoluments namely salaries, wages and allowances totalled $44.58 million for this period and accounted for 53.02 percent of the total recurrent expenditure. Spending for Goods and Services for this period amounted to $18.49 million, an 8.97 percent growth in spending on goods and services relative to 2013’s fiscal performance. The amount of $20.47 million being 24.34 percent of total current expenditure, was spent on our debt servicing obligations as we seek to ensure that we meet our debt servicing obligations on time. Total revenue and grants grew by 1.16 percent when compared to the same period in 2013. This was driven by a 7.32 percentage increase in current revenue. Total grant funding received during that period amounted to $2.93 million. Recurrent revenue collected for the period January to September 2014 stood at $94.8 million, representing 75.35 percent of the budgeted revenue projection for 2014. This is a remarkable achievement for the third quarter. As a result, we are optimistic that we can meet the budgeted revenue target for 2014 and surpass that collected in 2013, as our revenue collection tends to be relatively high during the fourth quarter. Our Tax revenue has performed fairly well during this period increasing from $66.16 million in 2013 to $72.8 million in 2014. This increase was mainly driven by VAT collections, which alone totalled 41.55 percent of the total tax revenue. VAT collection increased from $27.28 million in 2013 to $30.25 million in 2014, representing a 10.91 percentage increase. Second only to Stamp Duty charges which contributed 15.47 percent of total revenue collected. The performance of our Non-Tax Revenue was moderate. However, collections from the financial services sector and water services showed signs of increase. As we look at the main area of expenditure, we saw that the Ministries of Communication and Health absorbed most of the funding for our Capital expenditure. The Ministry of Communications expended $6.9 million by the end of the third quarter and the Ministry of Health spent $1.3 million over the same period. The major allocations relate to work done on the CDB Water Enhancement Project, the implementation of the Secondary Village Roads and Special Maintenance of our schools, among other areas of expenditure. It is also important to note, that substantial works have commenced on the modernisation of the High Court in Charlestown funded by resources from the Nevis Island Administration. It is also important to note that substantial work was commenced on the modernisation of the High Court in Charlestown funded by resources from the Nevis Island Administration. It is worthy to note, that for the periods 2013 and 2014, we have received very little budgetary support from the Federal Government despite our numerous assurances and requests. It is no secret that the SIDF funds are used to assist in the Federal Government development and also to fund a number of development projects in St. Kitts. The Federal Government has been approached by the Nevis Administration in respect of SIDF grants and our loans and we have, in fact, received some funds in respect of the Water Enhancement Project and for this we are grateful. However, your CCM Administration has not received, in our estimation, a fair and equitable amount of the SIDF funds, to assist us to maintain our fiscal balance but what we have done, is we have managed, through fiscal prudence, to ensure that we remain within the budgeted allocations which we have made for ourselves, to ensure that our fiscal position does not worsen and that we have a fiscal space within which to wiggle. Even as we achieved improvement in our fiscal performance, we have had to grapple with the four percent increase in the salary for civil servants for 2014, along with the unfreezing of increments and the impending three percent salary increase for 2015. Our hard working civil servants are deserving of this increase and we have made adequate provisions which you will hear about in our 2015 budget which will be read, as I said, in two weeks time. Even with the combined seven percent increase in salary and wages, there is a real possibility that at some point in the near future, there may be gratuitous payment declares for civil servants. I think last night I am told, that there was in fact a statement by the Prime Minister at a political meeting, which indicated that there is a possibility of not a double but a triple salary payment at Christmas time as bonus to civil servants. My Fellow Citizens, I wish to indicate that, that would complicate and become quite a challenge for this Administration. Even though up to this point we have managed to maintain fiscal balance in the manner in which we have run the Administration, to be called upon to pay a double salary and or as the threat has been sent out, a triple salary in December, would create additional burden on the Administration and this burden, we would not be able to meet that from our resources. We would therefore like to believe that the SIDF resources would be utilised and we would receive some grants from the SIDF, to ensure that were a double salary declared or a triple salary as it has been noised at the meeting by the Prime Minister, that we would be able to make that payment to our civil servants. 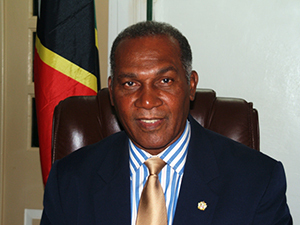 After all, my Fellow Citizens, the SIDF funds which are the results of the Citizenship By Investment Programme, should be equitably distributed between the Federal Government which services the people of St. Kitts and the Nevis Island Administration which has a responsibility, under the Constitution, to provide for the people of Nevis, as those funds come as a result of the sale “of passports” which are passports of St. Kitts and Nevis and therefore, there should be an equitable sharing of those resources, to ensure that the Nevis Administration and the people of Nevis are not marginalised. May I repeat, that we have sought, based on the challenges and the constraints which we have faced over the last nine months, we have managed to control our expenditure because we think it is our fiscal responsibility. We have done so within the confines of our revenue generation because at all times, the Nevis Administration run by the Concerned Citizens Movement believes that we have to take our responsibility to manage our affairs with prudence to ensure that we do not have any deterioration of our fiscal policy. Fellow citizens and residents, my Administration has worked tirelessly over the past two years to stabilise the Nevis economy. It has not been easy but we have stuck dutifully to this task. All indicators, however, for the new year should all things remain equal, is that we will see a trending upward in the growth of the economy based on discussions we have had with the developers, based on the government’s own plans to implement certain projects which will generate incomes and create employment for our people which will have a positive effect on our revenue collection. My Fellow Citizens, I want to say that I will give a more detailed report on the Government’s plans for 2015, when we have the debate of the Budget which will be read on the 16th of December and I pray that God will continue to prosper us today, tomorrow and forever.